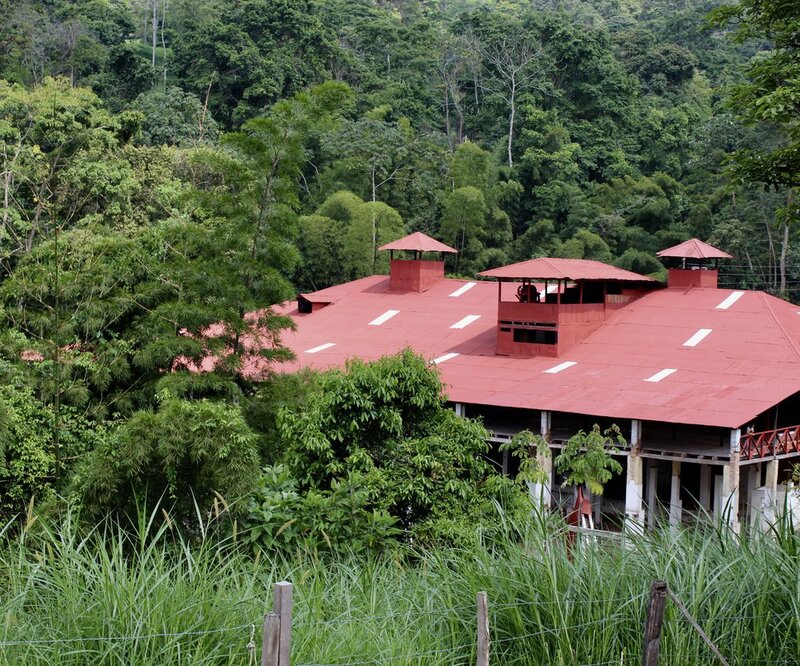 Cafetal de la Trinidad, established in 1894, is a working coffee and cattle farm that has been in the same family for five generations. 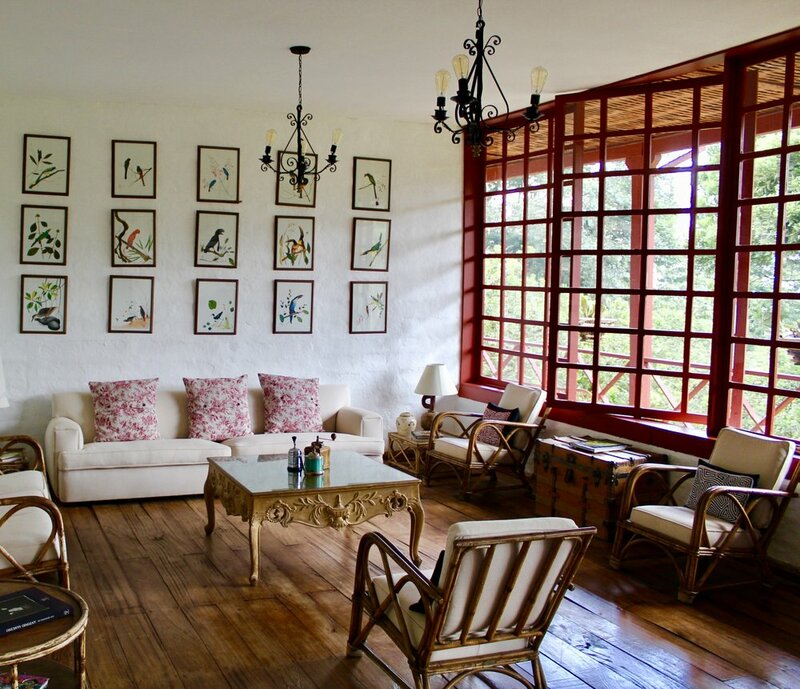 We are opening our doors for the first time in 2018 to welcome all to visit the farm, stay in the house, visit the factory, and enjoy a living piece of Colombia’s coffee history. Cafetal de la Trinidad was founded in 1894 by three partners, hence the name of La Trinidad, or Trinity in Spanish. After Colombia’s last civil war, the Thousand Days War (1899-1902), coffee planting enjoyed a boom in the Cundinamarca region of Tequendama, just hours away from Bogota past the spectacular Tequendama Waterfall. 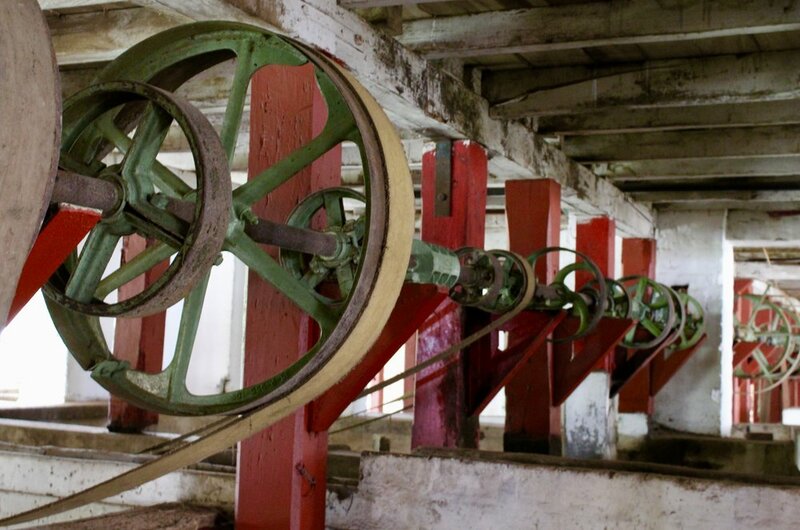 Trinidad was one of the first farms, or Haciendas, to pioneer large scale coffee planting in the region. By 1927, a seminal year in the history of Colombian Coffee, Trinidad had over 350,000 coffee trees, and exported directly to roasters in Germany, Holland, England and the United States. That same year, the Colombian Coffee Federation was founded to provide coffee a way of exporting to what had become Colombia’s trademark national crop. The roaring twenties, before the great depression of 1929, were a boom time for coffee, and Trinidad grew to become one of the largest coffee exporting farms in the country. In these days, what are now considered heirloom varietals such as Typica and Bourbon were planted by tenant farmers on the farm. Things changed with the Second World War, when Colombia entered the war on the side of the Allies, and coffee exports to what were its principal markets in Germany were interrupted. Following the war, labour unions from the region of Viota became the seed for left wing political parties in Colombia, and labour disputes led to the closing of many of the early 20th Century coffee estates in the Tequendama region. The coffee of Cundinamarca took a back seat to the better known Zona Cafetera of Antioquia, Caldas, Quindio and Risaralda. Few estates, like Trinidad and its sister farm, Misiones, survived the turbulent sixties and seventies. In 1977, during the Government of Liberal President Alfonso Lopez Michelsen, a drought in Brazil drove up the price of coffee to record highs, and the whole of Colombia enjoyed what became known as the Bonanza Cafetera. New investments in Trinidad, such as its now abandoned dormitories, and the innovative (but ultimately unwieldy) coffee duct were put into place. The late 80s and 90s were a difficult time for Colombian coffee growers, as the collapse of the international coffee pact in 1989 drove prices down, and Colombia’s security deteriorated as the FARC guerrillas gained territory. From the late 1990s to the early 2000s, the FARC guerrilla groups, present in the area around Trinidad, led to the decline of the farm, that was progressively converted to cattle ranching. From 2015 onwards, the farm has been renewed by a new generation of the family, who have been renovating the Castillo and Colombia coffee trees with the heirloom varietals that once grew in the region, and have opened up the farm for the public to visit a living piece of Colombia’s coffee heritage. In the early 20th century, Trinidad was planted in Typica or Bourbon coffee varietals. These varieties produced a fantastic cup but were low yielding coffee trees, and were susceptible to leaf rust, or roya in Spanish, a disease that can decimate the coffee crops. 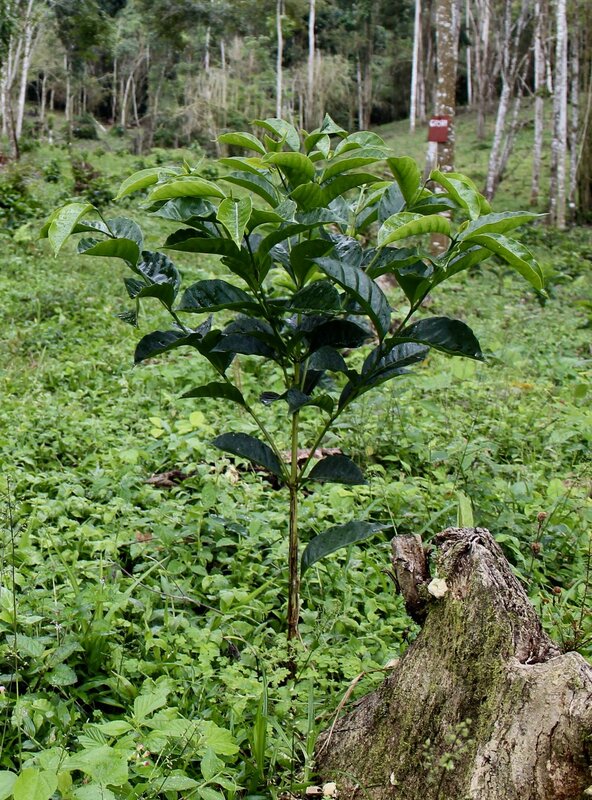 From the 1970s, CENICAFE, the Colombian Coffee Federation’s Research Center, developed the Colombia, Castillo and more recently the CENICAFE-1 varieties, that are resistant to leaf rust and produce a higher yield. Trinidad has now a plot of leaf rust resistant varietals (Colombia, Castillo, Cenicafe 1) and planted a varietal garden of seven different heirloom varietals (Yellow Bourbon, Red Bourbon, Geisha, Java, Moka, Pacamara and Saza). We plan to grow these to production, cup them along with our roasting partners, and grow in the varietals that best fit our soil and climate conditions. We have also discovered a few stubborn survivors of the first generation bourbon trees that were planted almost a century ago, growing wild in what are now cattle fields that survived the change to the leaf resistant varieties in the seventies and the change of land use to cattle ranching in the nineties. These trees are our heritage, and in our nurseries we are seeding them to create a new generation of the Trinidad Bourbon trees that have been living on the farm, and adapting to our soils, for the last hundred years. 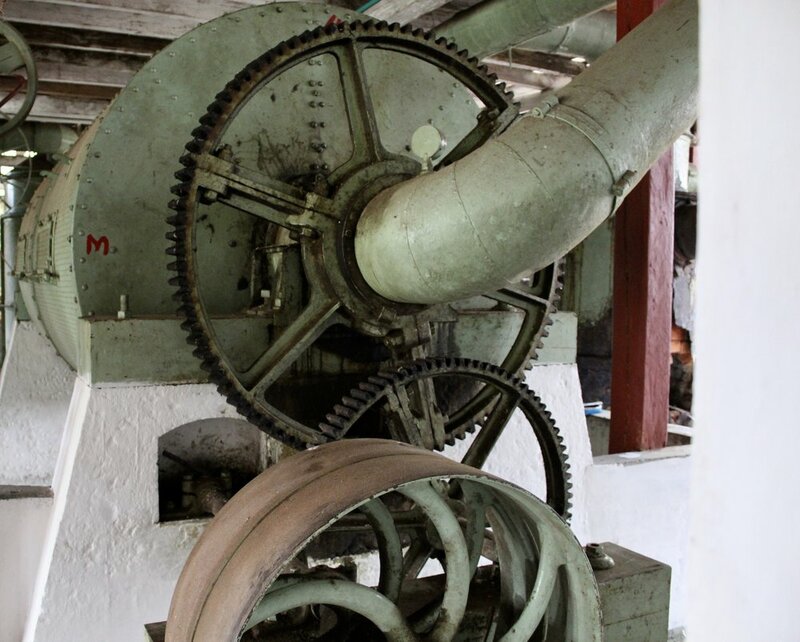 We have adapted our historic coffee factory dating from the 1920s, where we still maintain the original machinery imported from England, with the modern EcoMill machinery that allows for slow fermentation of the coffee in independent stainless steel tanks with minimal water consumption. Afterwards we sun-dry our coffee beans on bamboo African drying beds to ensure an even and gentle drying process that will maintain the best flavours inside the beans. We are working with select independent coffee roasters in Bogota, such as Trito Café and Colo Coffee, to recreate the taste of the past and offer our customers a truly unique experience. If you are interested in green or roast coffee samples please contact us directly. We are located just two hours from Bogota, in the town of Mesitas de Colegio. You can enter the farm either from La Victoria or from El Triunfo, although if driving from Bogota the entrance through La Victoria is a shorter drive. Trinidad can accommodate groups for either day trips (transportation can be arranged upon request) or for specially crafted coffee weekends. For a day trips, we can organize a horseback ride or a hike to the coffee varietals, where you can pick your own coffee cherries (if in season) and a tour of the coffee factory followed by a traditional Colombian lunch of bandeja paisa (rice and bean stew) and sancocho (chicken and avocado soup). If you would like to visit us for a boutique coffee weekend, please visit our page on Airbnb. From Bogota - Drive south of Bogota down to the Salto del Tequendama waterfall on the Road to Mesitas del Colegio. 12 km after the toll, you will find a sign at an intersection called 'El Pin' towards La Victoria. La Victoria is 13 km away. At La Victoria take a right on the main square, and a right again where you will find a gate to the farm. It is roughly a 2 hour drive from north Bogota. Contact us though email at info@cafetaldelatrinidad.com, visit us on Instagram @cafetaldelatrinidad, write to us on whatsapp at +57-3046419330 or check out our Airbnb site.